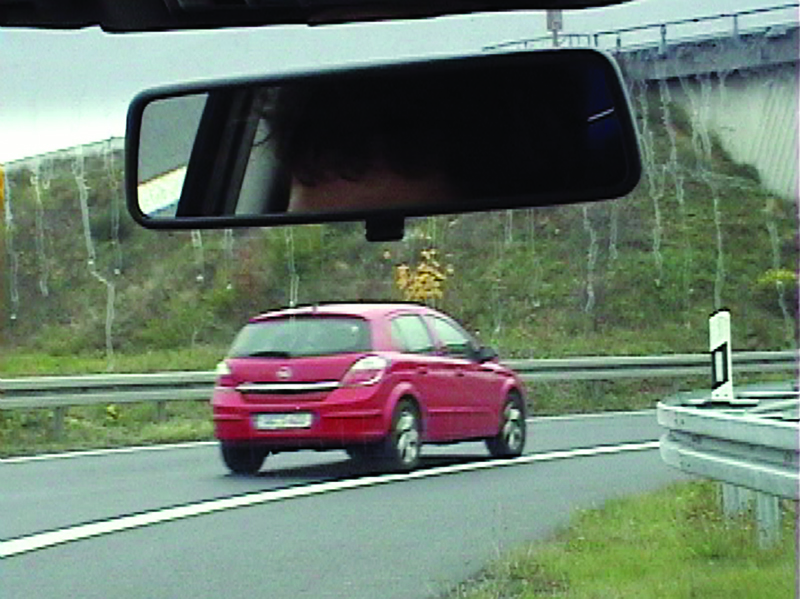 Pavel Pavlov’s video Every Bit of Landscape Beyond the Cloverleaf Interchange (Frankfurter Kreuz, Frankfurt, Germany) (2009) turns toward outlying suburbs to investigate the built character of our environment. The line of a German highway forms a sort of loop that guides the camera’s endless movement. Pavlov first creates a mobile and continuous image, which he then breaks down onto four screens. By increasing the number of planes in the exhibition space, the artist highlights the recurrence of standardized forms and renews the vision of these unremarkable landscapes. The new work is created especially for Le Mois de la Photo à Montréal. Pavel Pavlov wishes to thank Vidéographe’s Research and Experimentation Production Programme. The artist, a 2009 Development grant recipient, would like to thank the Conseil des arts et des lettres du Québec for its financial support. Pavel Pavlov was born in 1973 in Sofia, Bulgaria. He lives and works in Montreal, Quebec, Canada. Pavel Pavlov’s works revisit precarious landscapes — highway interchanges, parking lots — through urban planning and its construc- tion code. Subjected to methodical scrutiny, these unremarkable spaces hint at their own mutations and transformations. Pavlov tracks the characteristic signs of each place and produces an image of the site using its standard components, road signs and maps. In Ciné-Parc (2005), lampposts placed at regular intervals in an empty parking lot serve as successive viewpoints and fragment the surrounding landscape. The photographic rendering of the place is overlaid by and juxtaposed against schematic or textual images and aerial views obtained via Google Maps (Projet pour un panorama fragmenté de la Pointe Saint-Charles, 2008). They simultaneously yield the various possible views of the landscape and serve as a visual framework that constrains the gaze to follow a set path. Pavlov renews the experience of the panorama and the landscape excursion without requiring the photograph to provide a unitary vision of time and space. Using repetitive composition, he questions the construction of images and photographic stills bounded by a frame. He makes serial images that strip the visual down to its essentials, thereby carrying on the legacy of the minimalist photography of the 1960s and 1970s. In the form of film sequences or photographic fragments, Pavlov’s works update the process-orientation action so dear to conceptual strategies. Pavel Pavlov’s work has been featured in solo exhibitions (Gallery 44, Toronto, 2005) and group shows (Territoires urbains, MACM, Montreal, 2005). In 2008, he participated in the exhibition Conceptual Filiations (Leonard & Bina Ellen Art Gallery, Montreal). Tuesday to Saturday, 12 p.m. to 5 p.m.
> Artist’s talk, Saturday, Sept. 26, 2009 at 3 p.m.
Pavel Pavlov, Every Bit of Landscape Beyond the Cloverleaf Interchange (Frankfurter Kreuz, Frankfurt, Germany), 2009. Videostill. Courtesy of the artist.